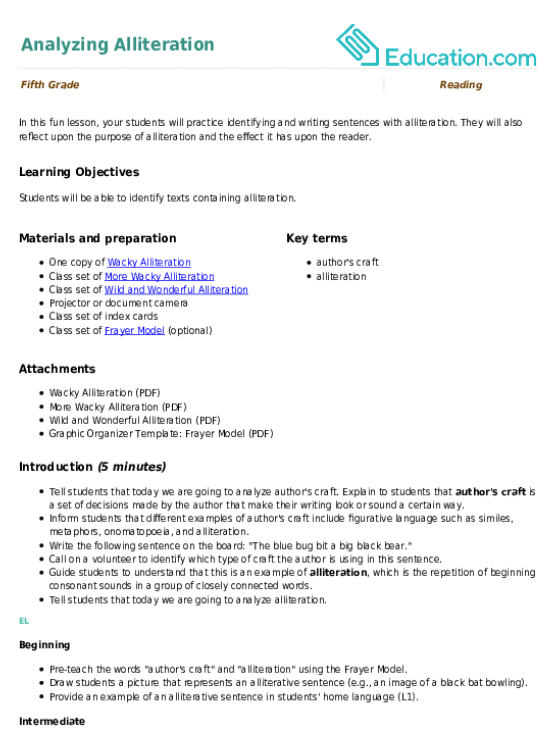 This lesson can be used as a pre-lesson for the Analyzing Alliteration lesson plan. Students will be able to identify texts containing alliteration. Students will be able to identify alliteration with descriptive adjectives and nouns using peer practice and support. Write this sentence on the board: "Rosy's going riding on her red rhinoceros." Call on students to share their observations about this sentence. Guide students to see that this sentence contains the repetition of the beginning consonant sound R.
Explain to students that the repetition of beginning consonant sounds in a group of closely connected words is called alliteration. 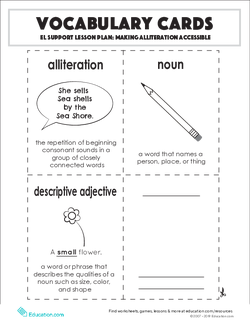 Show students the vocabulary card for "alliteration" and post it onto the board. Tell students that today they will be learning to identify alliteration in texts. Display the vocabulary cards for "noun" and "descriptive adjective." Review the definitions for each term and post them onto the board as the headings for a T-chart. Call on students to contribute examples for each term and write their contributions on the T-chart. Tip: Add visuals to the T-chart (e.g., a drawing of a monster next to the word "scary" and a drawing of a pig next to the word "pig"). 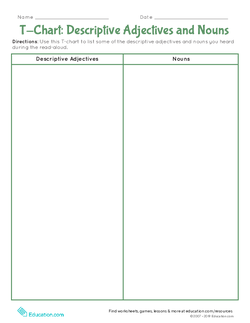 Distribute the T-Chart: Descriptive Adjectives and Nouns worksheet to each student. Tell students that you will read aloud a picture book and their job is to write down some of the different descriptive adjectives and nouns they hear in this worksheet. Read aloud a picture book that contains alliteration, like Dr. Seuss's ABC: An Amazing Alphabet Book by Dr. Seuss. Call on students to share some of the descriptive adjectives and nouns they heard during the read-aloud. 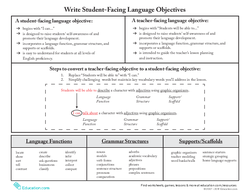 Write students' contributions on the T-chart under each heading. Remind students that today we are learning to identify alliteration. Call on students to identify descriptive adjectives and nouns from the T-chart that contain the same beginning consonant (e.g., "orange"/"owl" and "fluffy"/"feathers") and draw a line connecting these alliterative descriptive adjectives and nouns. Encourage students to draw connecting lines on their worksheet as well. Place students into pairs and ask each student to say an alliterative sentence using a descriptive adjective and a noun from the T-chart. Invite students to share their sentences with the class after practicing and sharing with their partner. Write the following sentence on the board: "There are four fluffy feathers." Read the sentence aloud and ask students to give you a thumbs up if this sentence contains alliteration and a thumbs down if the sentence does not contain alliteration. Ask students to think about which part of the sentence is the descriptive adjective and which part of the sentence is the noun. Call on a volunteer to write an "A" above the descriptive adjective ("fluffy") and an "N" above the noun (feathers). Point out to students that the descriptive adjective comes before the noun it is describing. 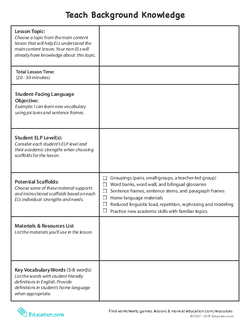 Project the Identifying Alliteration, Descriptive Adjectives, and Nouns worksheet and tell students they will practice identifying alliteration in texts with a partner. Read the instructions in Part 1 and draw their attention to the example completed for them. Assign students into partnerships to complete Part 1. Tip: Pair beginning ELs with more advanced ELs to provide support. Review answers as a class once everyone has finished. Direct students' attention to Part 2 of the worksheet and tell students they will work with partners to use the word bank of descriptive adjectives and nouns to fill in the sentence frames and create alliterative sentences. Review answers as a class once everyone has finished. 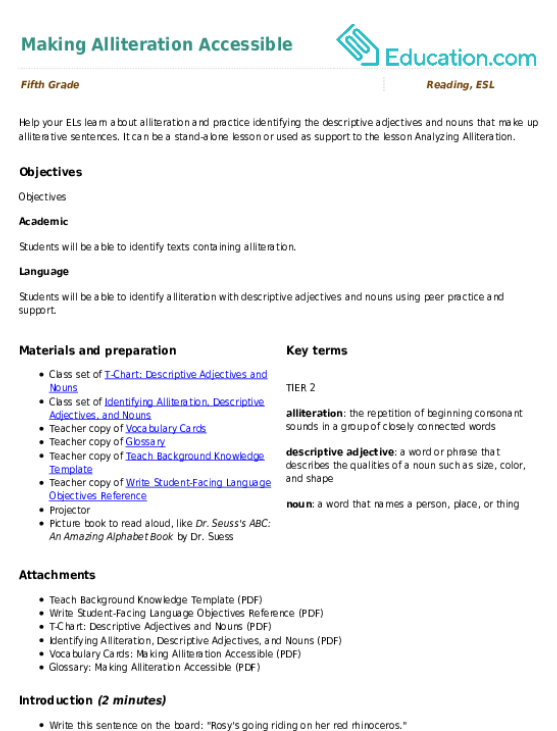 Direct students' attention to the third section of the Identifying Alliteration, Descriptive Adjectives, and Nouns worksheet. Read the nursery rhyme aloud as students follow along. Tell students to reread the passage and circle the examples of alliteration. When they are finished reading and marking the passage, have students write an "A" above the descriptive adjectives and an "N" above the nouns. Pair students with a partner and tell them to do the following: compare their answers, discuss how the alliteration makes them feel as readers, and discuss the purpose of this nursery rhyme. Call on volunteers to share some highlights from their discussions with their partners. Allow students to use bilingual dictionaries throughout the lesson to define unfamiliar descriptive adjectives and nouns. Provide students with access to the read-aloud text in their home language (L1). 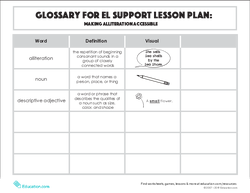 Strategically pair beginning ELs with advanced ELs when working on the Identifying Alliteration, Descriptive Adjectives, and Nouns worksheet during the Discourse Level Focus. Teach students about quantitative adjectives (adjectives that describe the quantity of something) and ask them to mark the quantitative adjectives with a "Q" on the Identifying Alliteration, Descriptive Adjectives, and Nouns worksheet during the Sentence Level Focus. Allow students to come up with their own alliterative sentences in Part 2 of the Identifying Alliteration, Descriptive Adjectives, and Nouns worksheet. Strategically pair advanced ELs with beginning or intermediate ELs and have them provide guidance and support to their peers. Tell students that you will write a sentence on the board. If the sentence contains alliteration, tell students to show you a thumbs up. If the sentence does not contain alliteration, tell students to show you a thumbs down. Write sentences on the board, one at a time, that contain alliteration as well as some sentences without alliteration. Tell students that author's choose to use alliteration in their texts for many different reasons. For example, it creates a rhythm when read aloud. Ask students to share with a partner other reasons why authors might include alliteration in their texts. Challenge students to search for alliteration in their independent reading at home and school. Students will love reading these wacky sentences to practice recognizing alliteration as they read.